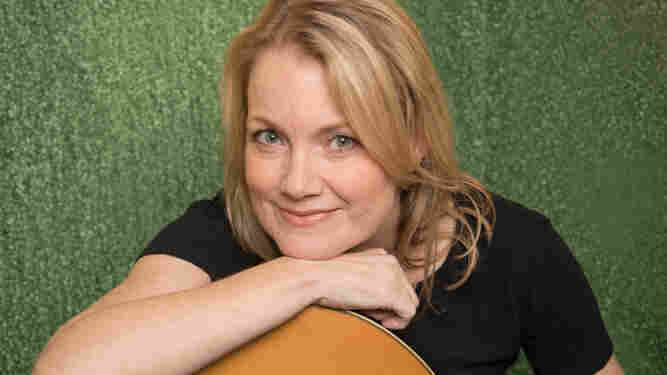 Kelly Willis, With Some Distance, Is 'Back Being Blue' Willis' first album of solo material in 11 years has the pillowy, R&B-glazed texture of country-pop in the disco era, without abandoning the singer's alt-country roots. Kelly Willis' Back Being Blue comes out May 18. It's not surprising when contemporary artists invoke Loretta Lynn as a template. But country icon's younger sister, the urbane country-pop balladeer Crystal Gayle, is a far less likely reference, particularly for an artist like Kelly Willis. Willis was an Austin rockabilly frontwoman before record man Tony Brown transported her to the country mainstream in the early '90s, as he'd already done with idiosyncratic voices like Steve Earle, Nanci Griffith and Lyle Lovett. Willis' subsequent indie output was embraced as part of the alt-country wave, an association bolstered by the company she's kept (including her songwriter husband and duet partner Bruce Robison) and the low-key approach she's taken to continuing her career (shifting her focus between performing and childrearing as she sees fit). Still, the tone-setting, self-penned title track of Willis' new album Back Being Blue (produced by Robison) has the pillowy, R&B-glazed texture of country-pop in the disco era, and she's said that she was thinking of Gayle when she recorded it. If the use of "blue" in the title and lyrics is any indication, Gayle's best known hit was probably a source of inspiration. Both songs dwell on a lover's departure, but Willis leavens her sultry sincerity with a touch of skepticism. Accompanied by weepy strings, she quotes the ex directly: "He said 'Our love, was one to be proud of, but wasn't the same.'" Here she pauses to set up the cold-bloodedness of the comparison, while the band stairsteps up an arpeggio. Then she places mildly mocking rhythmic emphasis on his description of his rekindled affair as "oh such a rare love," with the musicians mirroring her syncopation. "Up until writing that song, my songs were all feeling a little bit wordy and complicated and personal, and they just weren't clicking," Willis explained in her press materials. She would go on to write more than half of the album's 10 songs on her own, the sort of display of creative self-sufficiency that's respected among singer-songwriters, but steer her compositions toward deceptively unsophisticated forms of classic country, pop and rock and roll, enlivening them not only with feeling, but flickers of self-awareness and wit. In the jangly, bouncing "Only You," Willis inverts the starry-eyed sentiment of a phrase sprinkled throughout the pop lexicon. Instead of making an object of affection out to be her sole source of happiness, she rolls her eyes at a cad's audacity. "Only you could take your crimes, swear you thought I knew, say it happens all the time: 'That's just what lovers do,'" she scoffs, her melody sunny and brisk. The string band two-step "Fool's Paradise" describes a situation that would certainly merit a barroom weeper: dealing with a fickle lover's manipulative ways. But when she sings, "All that ache in your voice, like I don't have a choice," the composure in her voice conveys distrust of such an emotional display. Willis does dabble in honky-tonk melancholy elsewhere. "Freewheeling" is her take on managing the excruciating disconnect between outer perception and inner state. In "What the Heart Doesn't Know," a lilting, lament whose acoustic strumming is overlaid with piano and fiddle filigree, she takes up the time-tested theme of how emotional attachments resist reason. In the country shuffle "Afternoon's Gone Blind," one of the album's outside songs, she portrays coping as a halting, highly undignified process. "Seems to me that every day is a little bit hotter than the other one," she complains conversationally. "Seems to me that every way that I try to get through 'em is the stupidest thing that I've ever done." Willis also chose to record "I'm a Lover (Not a Fighter)," a swinging, congenial entry in the country tradition of domestic sparring. The way she lets her aggravation show through the honeyed veneer of her delivery makes her version feel a little more knowing than Skeeter Davis's 1969 original. In the loping, reflective folk-country number "We'll Do It For Love Next Time," drawn from the catalog of Rodney Crowell, Willis' attack of densely packed lines is lusty and slightly teasing. The song is an appraisal of a used-up, youthful romance. During the string-swathed bridge, she invites her ex to share a rueful chuckle over their mutual impulsiveness: "You and I know, we never ran low on passion / It only goes to show, lovers come and go like — I don't know — springtime fashion." Without making any fuss, Willis proves that she can have it both ways, and that's a source of pleasure for us listeners, too.